A week before his murder trial in January 1927, the Rev. J. Frank Norris announced that his Sunday sermon would be on the trial of Jesus before Pontius Pilate. Norris was clearly putting himself in the position of Christ; he was a righteous man oppressed by the forces of a state that wanted him silenced. When that argument failed to sway the general public, the Rev. Norris went to the Old Testament Book of Esther which recounts the story of Haman and Mordecai — a gallows built by the king’s favorite prince, Haman, to execute Mordecai was instead used to hang Haman, a biblical lesson that all princes and hangmen should take to heart. Like Mordecai, Norris was convinced that his trial was a vendetta sponsored by those who opposed him speaking the truth. A media-savvy man before his time, Norris, who was a world-famous Texas Baptist evangelist and well-known foe of evolution, hosted a radio station at his church, published a newspaper, and broadcast his sermons nationwide. One can imagine what he would have done with the Internet or cable television. Although he was well-known among those on the evangelism circuit, the mainstream Baptist churches of the United States did not have much use for the minister. Twice he was refused a seat at the Baptist General Convention, as were other representatives of his church. Perhaps it was his background which gave the church elders some concern: This trial would not be Norris’s first time in the docket. In 1912, his church in Fort Worth burned and he was indicted in connection with the fire, deemed to be arson. With a defense paid for by a supportive congregation, Norris was acquitted of arson and perjury. Following the burning of the church Norris said he received written death threats. The homicide victim, Dexter E. Chipps, was almost as famous in Texas as his killer. Chipps was a wealthy businessman and pioneer in the hardwood lumber business of the state, according the San Antonio Light. Chipps was shot and killed in the minister’s study on July 17, 1926. According to the prosecution, a drunken but unarmed Chipps went to Norris’s house to protest against the evangelist’s criticism of the businessman’s close friend, Fort Worth mayor H. C. Meacham. Norris claimed Chipps attacked him without provocation. Both sides would present witnesses who claimed to see Chipps in the office building the day he was gunned down. They differed on just where they saw the lumberman, however. Whether or not Chipps was shot in the minister’s office or in the vestibule outside the study was the major question in the case for on it hinged Norris’s self-defense claim. An easier case for self-defense could be made if Chipps was killed in the study, while the state attempted at trial to show Chipps was leaving the meeting when he was shot. Chipps was shot five times: one through his left side four inches below the collar bone, two wounds through the right shoulder, and two others close to the heart. One of the bullets passed through Chipps’s body and through his left elbow. Chipps died on the stretcher in the church office without making any statement, the ambulance driver testified. Although there was a blood stain about the size of a half-dollar found in the vestibule, its presence there was inconclusive. It might have left there when Chipps’s body was removed. To bolster Norris’s claim of self-defense, a bullet hole was found in the ceiling of his office. That could have been the bullet that passed through Chipps’s body. The case of the Rev. Norris was great fodder for the newspapers of the time, and Norris had no problem talking to the press. “How do you reconcile the killing of Chipps with the Commandment ‘Thou Shalt Not Kill? '” asked one reporter. During jury selection after the case had been moved at the request of the defense to Austin, Norris said the only thing that could convict him of murder was if there were too many Catholics on the jury. On the other side, Norris, a reputed member of the Ku Klux Klan (he denied this), had the support of that organization. Norris had a solid argument that he could not get a fair trial in Tarrant County: At the change of venue hearing, Mayor Meacham admitted that he had agreed to pay $15,000 (about $200k today) personally toward the prosecution of the minister for the murder of his friend. The gallery was packed by observers — mostly members of Norris’s church — when the trial opened. His loyal supporters had already raised about $20,000 (approximately. $270k today) for his defense. The weather was unseasonably cold for Austin, so the choice seats were near the coal-burning stove on the side of the courtroom. A special prosecutor had been appointed for the state: William P. (Wild Bill) McLean, described as “a picturesque figure of Southwest court circles,” was an unusual choice; he was usually a defense attorney. Norris was successful during jury selection: all 12 men on the jury professed a literal interpretation of Genesis and disputed the idea of evolution. The jury was overwhelmingly Protestant. The prosecution’s star witness was Roxie Parker, widow of a Tarrant County judge. She had been trying to interest the minister in buying her farmhouse for use as a Sunday School camp. According to Parker, the minister agreed to come look at the property but had never shown up. As a result, she decided to drop by his office to see if he was still interested. The man who appeared in the anteroom was a hale and hearty, albeit angry, Dexter Chipps, she said. As Chipps said he would return, he turned slightly and for a moment appeared to be heading back into the office, she said. According to Parker, Norris was standing about five feet away from Chipps when he fired the fatal shots. During cross-examination Parker stood behind her story, rarely even deviating from the words she used during direct. “I saw Dr. Norris shoot the man when the latter was leaving Dr. Norris’s private office,” she testified. “I was in Dr. Norris’s office the day before the killing to talk to him about the sheriff’s race and I told I had heard Chipps threaten to kill him and told him the kind of man Chipps was,” testified Fred Holland. “I will kill you if you don’t leave my friends, Meacham, Roach, and Austin alone,” he said Chipps yelled at Norris. Of course, the star witness was the Rev. 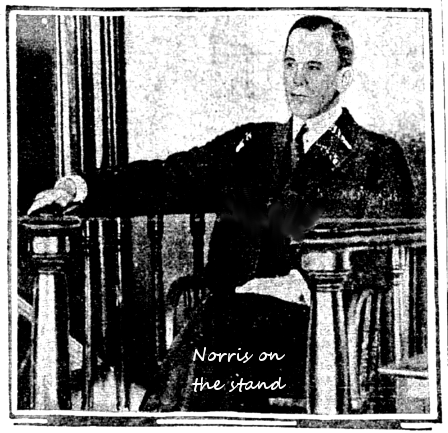 Norris himself, who took the stand as the defense’s last witness. Norris said he first spoke with Chipps on the day of the murder by telephone and that the businessman arrived at his office about 20 minutes later. Norris said he went to the door to the anteroom and demanded that Chipps leave. With tears in his eyes and an uncharacteristic tremor in his voice, Norris said he saw Chipps reach back to his hip, at the same time he began moving toward the minister. After hearing the prosecution call for the death penalty for “the pistol-packing parson,” the jury retired to deliberate. It took the members just two ballots and less than 90 minutes to find Norris innocent of murder. Wild Bill McLean was angry with the verdict, but like Pilate, washed his hands of the matter. “When he goes back and begins slandering people again, and you open up the paper and see where he has killed another man — not a poor drunken man this time, he’ll be your criminal and not mine,” he said.